Book your next OKC adventure to this newly renovated 3-bedroom, 2-bath vacation rental house just 10 minutes from downtown. With enough space to comfortably sleep 6 guests, this Southwestern residence boasts a brand new interior, front patio, exercise room, and a spacious backyard. Whether you're in town for work or play, this is the perfect Oklahoma City home base! Boasting 1,300 square feet of comfortably furnished living space, this home is a perfect size and layout for families or friends looking to visit Oklahoma City's top attractions. 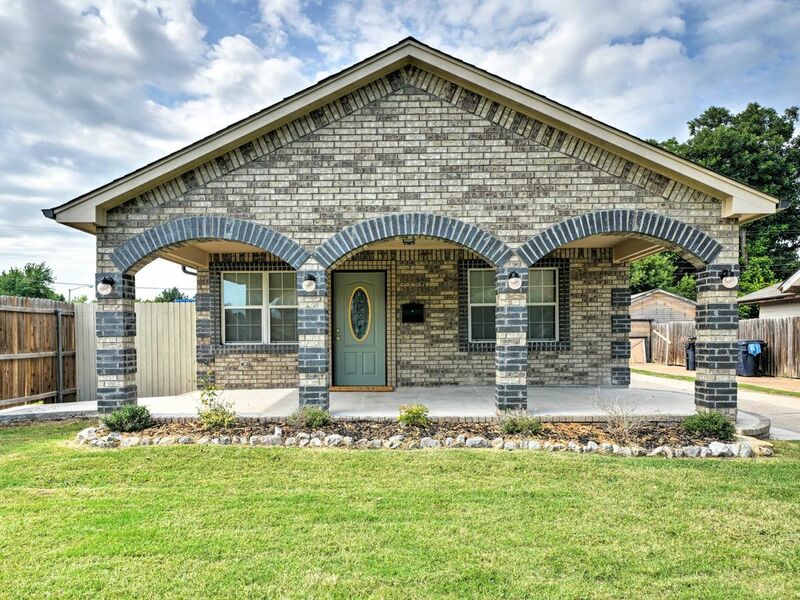 Upon arrival, you'll be greeted by a beautiful arched stone front patio and a well-manicured front lawn. Step onto the tile flooring of this charming residence and sink into the plush 3-person living room sofa. The interior is characterized with a warm, inviting décor coupled with plenty of space for you and your companions to spread out and relax. When your stomach starts to growl, make your way into the fully equipped kitchen to showcase your Iron Chef skills. Equipped with stainless steel appliances, beautiful countertops, and all of the cooking essentials, this kitchen has everything you need for your favorite recipes. On your leisurely days, unwind in the cozy living room where you can look forward to watching your favorite television shows on the mounted flat-screen cable TV. Enjoy a family-style meal at the expandable dinner table followed by sunset cocktails in the private backyard to end the night! Each of the 3 spacious bedrooms offers ample closet space to keep your outfits wrinkle-free and beautiful wooden bed frames housing cloud-like mattresses. Wash your dirty duds in the in-unit laundry machines while you gain a restful sleep and jumpstart your morning with a refreshing rinse in one of the 2 pristine bathrooms to start your day! Located 8 minutes from 2 major city hospitals, this house is the perfect home-away-from-home for traveling nurses. The Oklahoma State Fairgrounds are only 8 minutes from your door for anyone looking to enjoy some carnival entertainment and delicious delicacies! Sports fans love this property due to its close proximity to all of the OKC professional sports arenas. Drive 11 minutes to watch the Thunder play at the Chesapeake Energy Arena or 4 minutes to watch the Oklahoma City Energy play at Taft Stadium. The Oklahoma City National Memorial & Museum is a 13-minute drive from the house and a hugely impactful memorial to those lost in the 1995 Murrah Building Bombing. To say this memorial is powerful is an understatement, but it's one of the most beautiful sites you can find in the city. You'll only have an 11-minute ride from the airport so you can minimize your commute time and maximize your OKC experience. Be sure to grab a meal at one of the downtown eateries while you're in town as well. Some favorites are Kitchen No 324, Cheever's Cafe, The Press, and Nic's Grill! Another busy and fun area close to this house is the Paseo Art district just 12 minutes from the house. It is a historic touristic site with many popular restaurants such as the Paseo Grill and Picaso Cafe. It is usually packed with art lovers! - Amenities include a fully equipped kitchen with stainless steel appliances, a front patio, private yard, decorative fireplace, a flat-screen cable Smart TV, complimentary linens and towels, workout room, complimentary toiletries, free WiFi, in-unit laundry machines, driveway parking spots, and more! - Fantastic Oklahoma City Location - 10 minutes from downtown and top-notch eateries, a 13-minute drive from the Oklahoma City National Memorial & Museum, 11 minutes from the airport, 8 minutes from the OKC State Fair, and close to 2 major hospitals, hiking, sightseeing, and so much more! Great house everything was as it was described, but the outdoor trash cans were not there. I had to leave the trash outside of the door. Everything else was good. There were so many requests by the property owner, we weren’t comfortable. The property is beautiful. Certain items should be in operational conditions (heat) before they are rented out. Property owner had a long list of donts, Certain lights were on when we came back to the house after being gone all day, that we didn’t turn on. Made us wonder did the property owner live in the same block as property. Not enough seating for 6 people. Furniture needs to be updated. "We sincerely apologize you had a negative experience at our home. We know we owe all our guests a duty to keep the house as comfortable, and as sanitary clean, to the best of our ability. As a result, we are truly sorry. Regarding your complaint that the house was cold; this is a newly renovated home with a new heat and air unit. We just had a summer where the ac unit was working fine. By the time you checked in, it just started getting cold, so no one has had the opportunity to use the heat, which to the best of my knowledge was working fine at the time of installation. However, when we noticed that the Heat furnace was not turning on prior to you checking in, we immediately notified Evolve, your booking company to see if they can notify you of the situation and cancel your reservation. Evolve gave you the option of either canceling the reservation or receiving a one night discount. You decided to take the one-night discount option. So, you were also fully aware there was an issue with the heat prior to you checking in. We also did notify you about the heat situation a day or two prior to your arrival. You asked when the heat issue will be resolved, we told you the next day which was a Friday. The heat issue was fixed on Friday as promised. Regarding your coming back and meeting light in the house. The guys who worked for the gas company probably forgot to turn off all the lights in the house. You were fully aware the gas company was going to come work at the house that Friday. There is no way they could have resolved the heat issue without them coming inside the house. Also, your concerns about house rules, these rules I have posted are the regular house rules I have on the listing. I just printed copies and posted at the house. To remind the guest of no smoking, no parties, take your trash, where to keep dirty laundry…nothing extraordinary. Thank you very much for the review. We take our reviews seriously as fair complaints only serves us an opportunity to improve and provide better services to our guests." The house was very cold. no heat, we froze all night and during day when there. uncomfortable because of the lack of heat. "We sincerely apologize you had a negative experience at our home. We know we owe all our guests a duty to keep the house as comfortable, and as sanitary clean, to the best of our ability. As a result we are truly sorry. Earnestly, we really were not sure you had decided to spend the night at our home. The reason being that the moment you stepped foot in that house you called us and “aid our house is filthy and not up to your standard. You stated that you were calling Evolve to see if you could go somewhere else with your six guests”. This was the last conversation we had with you, and we never heard back from you. We were not sure you stayed or left. I am sure you actually did call Evolve because Evolve called me. I sent them pictures of the house prior to you checking in to show them that the house is sparkly clean. I am sure they also asked you to take pictures of the house as well, so they see the condition of the house as is, but you never sent them any pictures. Regarding your complaint that the house was cold. This is a newly renovated home with a new heat and air unit. We just had a summer where the A/C unit was working fine. By the time you checked in, it just started getting cold, so no one has had the opportunity to use the heat, which to the best of my knowledge was working fine at the time of installation. We wish you had told us you decided to spend the night at our home, we could have at least bring area heaters to you, and immediately call our maintenance guy to look into the issues, but instead we never heard back from you. Thank you very much for the review. We take our reviews seriously as feedback like this only serves us an opportunity to improve and provide better services to our guests." Thomas K.Minocqua, Wis and Spring Hill Fl. Good location and everything we needed. The home was very easy to find and we enjoyed our stay. We had no issues and would rent again.